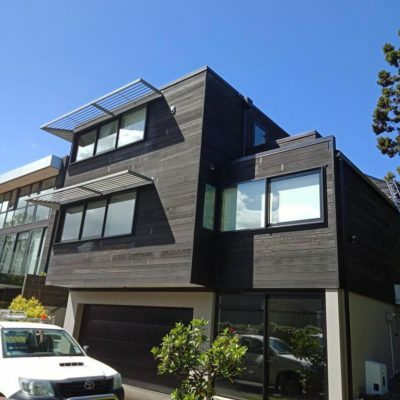 To help you get your house looking pristine, we at NZTS put together a list of the top 5 exterior house washing tips. Here at NZTS, we love to see people getting out there and giving it a go. Here in New Zealand, we’re known for our ‘do-it-yourself’ attitude to life. And what’s more Kiwi than doing work around the house on a hot summer day? The best way to wash a house is with the soft wash method. This involves using a water blaster to spray a combination of bleach, detergent and water onto your surfaces. By combining these ingredients, you can rest assured that hard-to-remove dirt and mildew will wash off with ease. To do this, you will need a water blaster with a chemical venturi. This will enable you to draw a house wash chemical mix through your high pressure hose and onto the house surfaces, saving you hours of meddling with plain water and low-pressure sprayers. For a medium sized house, mix 5 litres of household bleach with 4 litres of water and 1 litre of dish wash liquid. Leave the solution on the house for 5 to 10 minutes and then wash off completely. Marvel at your pristine clean house, and tell your friends how great it looks. This solution will provide a deep clean to a level that water blasting and scrubbing can’t achieve. You’ll be left with a shinier house, that will stay clean for longer. The household bleach is relatively non-toxic, safe to wash around established plant life and water-soluble. It easily washes away, and residue will biodegrade with a little bit of sunlight and heat. Working at heights is one of the most common causes of injury around the home. Ladders are dangerous as is – however when water is added into the mix, the risk is compounded. Keeping yourself safe when washing your house is extremely important. The best way to do this is to stay on the ground and to avoid climbing a ladder or walking on roofs (it also saves lots of time if you don’t need to continually move up and down). Which nozzle should I use? Blue nozzles are designed to shoot the house wash chem mix up to 10 meters high. Red nozzles do the same with water to rinse off. If you need this system set up on your water blaster, you’ll need to see a specialist house wash equipment/water blaster supplier. Scroll to the bottom for a list of our favourites. When you’re washing and rinsing windows, flashings and fittings, make sure to spray at a sharp angle. Water ingress is a very common problem in the house washing industry – especially when it comes to wooden window frames, roof flashings and light fittings. However, it is easy to avoid getting water inside your home if you know better. After you’ve applied the house wash chem mix, gently wash off with a white nozzle at a sharp angle to the house (i.e. spray down the side of the house and never straight at it if you can avoid it). Always spray either above windows or on the window itself. Never spray across the joins in the frame. Use a house wash brush to get into those hard to reach areas around windows if necessary. Always take a moment and plan before you pull the trigger of the water blaster. It’s much easier to prevent water going inside than it is to clean up after you soak the interior of your house. 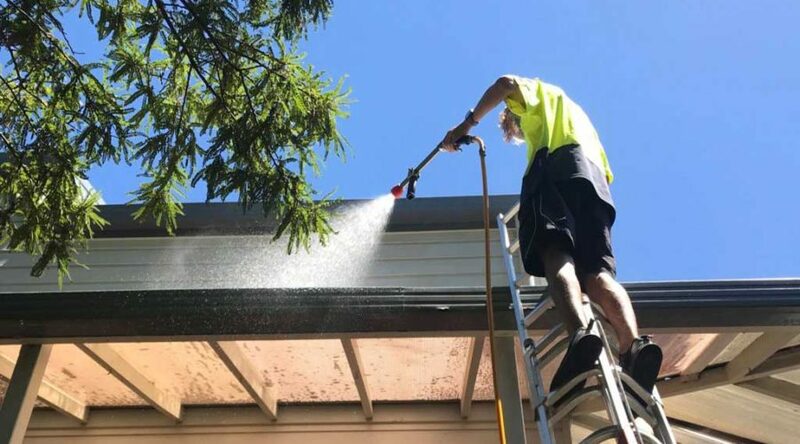 An annual soft house wash will generally be recommended by most painters and is often is a condition of the warranty provided by paint manufacturers. Soft washing is a form of preventative maintenance that helps to prolong the life of your paint and exterior building materials. It is also much gentler on the building than commercial washes. This is because much less pressure and chemicals are required to get the job done. 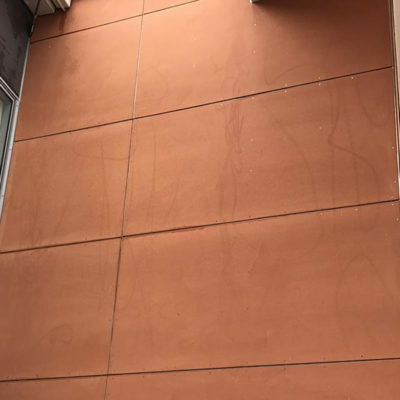 Before you go ahead with water blasting your house, make a plan for which areas you are going to tackle and how you will access hard-to-reach areas. Break the work up into sections, and start with the all the extras such as paths, decks, furniture, pergolas and balconies. This will save you needing to wash your house twice. Always use your house wash chem mix as described in point 2 and a soft brush on surfaces before you run the risk of water blasting up close and doing damage. For an even more in depth techniques about correct building washing, check out our Ultimate House Washing Guide. 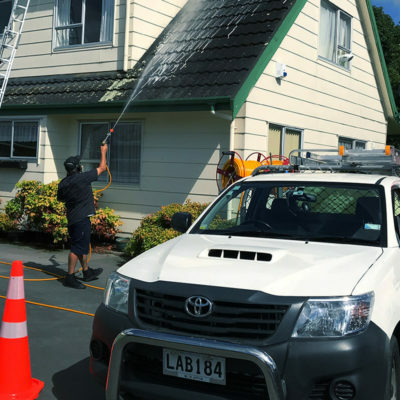 Here’s a list of specialist suppliers in Auckland that have everything you need to adapt your existing water blaster. If your current equipment is not sufficient, they can sort you out with a brand new kit too. We are specialists in getting your house exterior looking great. Whilst we love to encourage people to give it a go, we’re here if you need any help or assistance. Click here to see a list of our services offered – or contact us today for a free no obligation quote. Get an instant, no obligation quote now using our online calculator.